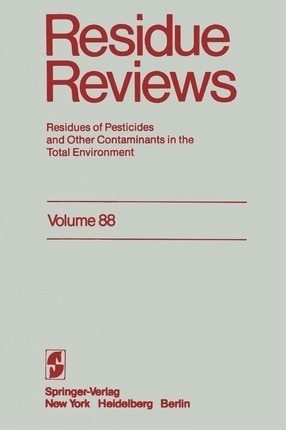 Worldwide concern in scientific, industrial, and governmental com- munities over traces of toxic chemicals in foodstuffs and in both abiotic and biotic environments has justified the present triumvirate of specialized publications in this field: comprehensive reviews, rapidly published progress reports, and archival documentations. These three publications are integrated and scheduled to provide in international communication the coherency essential for nonduplicative and current progress in a field as dynamic and complex as environmental contamination and toxicology. Until now there has been no journal or other publication series reserved exclusively for the diversified literature on "toxic" chemicals in our foods, our feeds, our geographical surroundings, our domestic animals, our wild- life, and ourselves. Around the world immense efforts and many talents have been mobilized to technical and other evaluations of natures, locales, magnitudes, fates, and toxicology of the persisting residues of these chemicals loosed upon the world. Among the sequelae of this broad new emphasis has been an inescapable need for an articulated set of authorita- tive publications where one could expect to find the latest important world literature produced by this emerging area of science together with documentation of pertinent ancillary legislation.